External shots of Aachen Cathedral. It was built by Charlemagne, the first Holy Roman Emperor, in 805 AD and is one of the oldest churches in Germany containing a wealth of treasures from the early medieval period. This is a view from the Gallery looking down into the heart of the Palatine Chapel in Aachen Cathedral. The Palatine Chapel (c.786-805AD) is one of the most important surviving examples of Carolingian architecture anywhere. It is also known as the Octagon for its distinctive octagonal central area. I've borrowed this photo to show the view looking up at the gallery. The columns of the gallery are purely decorative, and does not bear any weight from the arches. 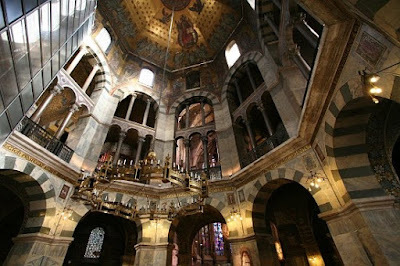 Charlemagne had 32 of them shipped from the ancient buildings in Rome and Ravenna. Most of them were looted in the French Revolution but 22 have since been returned and restored to their place in the gallery. The grilles between the pillars were cast of bronze under orders of Charlemagne for this cathedral. They have elaborate patterns with Roman, Celtic and Frankish influences, and are matched in pairs across from each other. Another borrowed photo to show a close up of the chandelier. 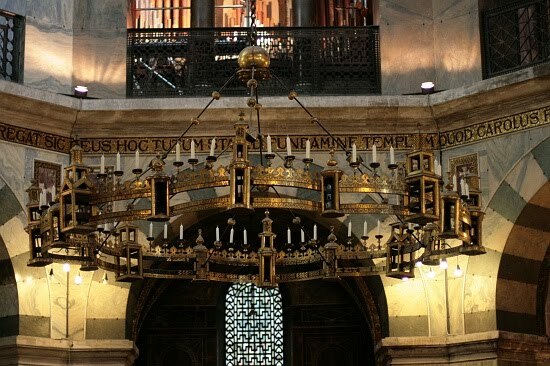 Suspended from the vault is the Barbarossa Chandelier(circa 1184) which hangs from the vault in the Palatine Chapel. It is humongous! 4.2 metres diameter - a bronze circlet commisioned by Frederick Barbarossa for the occasion of Charlemagne's canonization. Restoration work still being carried out. Just one of the incredible mosaic ceilings to behold. We joined a guided tour to gain access to this part of the chapel to see this marble throne on which 32 Holy Roman Emperors had been crowned between 936 and 1531. The throne dates back to Carolingian times and was likely used by Charlemagne himself, though not for his coronation, which took place in Rome. The throne consists of four ancient marble slabs held together by bronze clamps and there are six marble steps, partly carved from an ancient column which alludes to Solomon's throne.